God Bless Ateneo... if the DLSU Lady Spikers play well in Game 2 of the UAAP Women’s Volleyball Final this coming Wednesday. Because the Lady Spikers were crap in the first two sets today, just did enough to eke out wins in the next two sets and then methodically picked up the points in the abbreviated fifth set as the Lady Eagles imploded. The score was 20-25, 17-26, 25-22, 25-22 and 15-6. The way the Lady Spikers played in the first two sets was what all my players know I mockingly call perdegana. You know, that variant of the game of checkers for which the objective is to lose your pieces in order to win. This was not the DLSU team that went on a 14-game streak on the way to the final after losing the season opener to UST. Coach Ramil de Jesus, speaking in the post-match interview, hit the nail right on the head. If the Lady Spikers play anything like the way they did in that second round game against Ateneo at the MOA, then the Lady Eagles will have to console themselves with yet another bridesmaid’s finish. The girls, he said, were being overwhelmed by the occasion as well as the crowd; although why the 2-time defending champions were the ones losing focus on the big stage, that he did not elaborate on. Credit, it must be said, must be given where it is due. That the Lady Spikers were crap was as much due to Ateneo’s brilliance as it was to DLSU’s own failings in the first two sets. Frankly, all indications were that Ateneo would pay La Salle back for the ignominy of that straight-sets loss to their archrivals at the MOA Arena in the second round. The Lady Eagles were that dominant. The third set, however, was always going to be Ateneo’s bridge too far. There were no questions anymore about Ateneo’s ability as a team – it was there for all to see in the first two dominant sets. From the third set onwards, however, the shadowy horned figures of doubt started to dance inside the players’ minds. The pundits were saying that the seniors among the Ateneo squad were fully motivated to graduate from college with championship medals; and that perhaps explained the adrenalin-spiked performance in the opening two sets. The very same seniors, however, were probably also the ones with the most horned figures inside their heads. These sprung from the knowledge – or, perhaps, fear is the better word – that they were playing not only the defending champions but also the very same team who pulled themselves out from the same hole that they were in the first time that these two sides played each other in the first round. That was also the game when La Salle snapped Ateneo’s unbeaten first-round streak. Ateneo went on a mini-freefall after that loss. Who knows how different things could have been had Ateneo managed to keep its streak? So thus, Ateneo in today’s third set started to look as fumbling as a team as the Lady Spikers were earlier. Not immediately; just initially a perceptible drop in dominance and swagger. Crucially, Ateneo could not pull away from La Salle in the third set and then fatally allowed the Lady Spikers to inch ahead. Now being ahead and staying ahead, that is something that DLSU knows all about. That is why they are the defending champions. 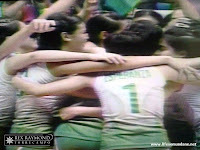 Suddenly, the Lady Spikers were making the horned shadows materialise for Ateneo in the form of errors. The fifth set score told the story of the entire match. It summed up the complete turnaround not only of Ateneo but of La Salle as well. Those who watched the match were probably asking themselves how La Salle could have suddenly turned into a team of clueless individuals after masterfully disposing of Adamson University in the semi-finals just a week ago. By the fifth set, they were probably asking themselves how Ateneo could have become the team that La Salle was in the first two sets. Former DLSU player Stephanie Mercado, interviewed by the panel, probably summed up the DLSU performance: that of a diesel team. The whole week’s rest could not have been favourable; and, indeed, teams who are on a roll do not like to rest. They just want to keep playing – and winning! Even champion teams are allowed a bad game; and crucially they always pick themselves up after such performances. Make no mistake about it, this was DLSU’s bad day! And the team still won. Focus, then, will be the most important thing for both coaches next Wednesday. La Salle is probably just marginally better than Ateneo; but that nervy performance in the first two sets showed a lack of focus unbecoming of a champion team. It ought to be a source of concern for de Jesus. For Ateneo, meanwhile, superhuman focus will be required of each player to exorcise these shadowy figures that are all that is stopping the Lady Eagles from making that decisive step to becoming a champion team.